Our 6 week in-person program makes smart contract development easily accessible for your students, alumni, and partners. Blockchain technology is transforming global industries like military supply chain management, finance, and insurance. Understanding smart contract development and decentralized application development will prepare students for this technological shift. In partnership with CT-based Higher Ed Institutions, we are excited to offer the following program. In support of blockchain education, subsidies may exist in your local city or town to offset costs. Not based in CT? Reach out to us to see if we can bring DappDevs to your university. Please note that program details and availability may vary by state. Introduction to the foundational concepts necessary to understand the fundamentals of a blockchain, the components which make up the Ethereum Virtual Machine, and the tools you need to start building. Understanding cryptocurrencies, economic modeling, and mechanism design. We’ll get you comfortable working with some of the basic smart contract functions related to cryptocurrency. Introduction to Solidity structure and syntax. Understanding basic data storage contracts. Introduction to Web3.js which will allow you to interact with smart contracts and an Ethereum blockchain. Studying data structures and considerations. Exploring ERC Patterns, libraries, events, and common methods. Intensive: Testing, Tooling, Patterns, and Libraries. Testing smart contracts with web3.js and mocha framework. We’ll cover unit-testing, multi-contract systems, factories, and permissioned storage. Understanding factory patterns, database patterns, inheritance, function overloading, and signatures. Going from use case to application design by drafting specifications. Understanding blockchain considerations for your application. Deploying your app to a test network. Smart contracts, services, and interfaces. Understanding complex contract integrations, app frameworks, and how to integrate with your application. Light dive into oracles and IPFS before kicking off into final project. “It was an incredible experience to see our attendees take their first step towards becoming blockchain developers. I am confident that the DappDevs two-day program they participated in has prepared them to add value as a technical team member during a blockchain hackathon. I'm excited to see and participate in a longer-form course from them." Students who successfully complete our program, in addition to their primary computer science studies, will be well-equipped build simple prototypes to illustrate a potential use case for blockchain technology, and should be ready to participate in events like blockchain hackathons. 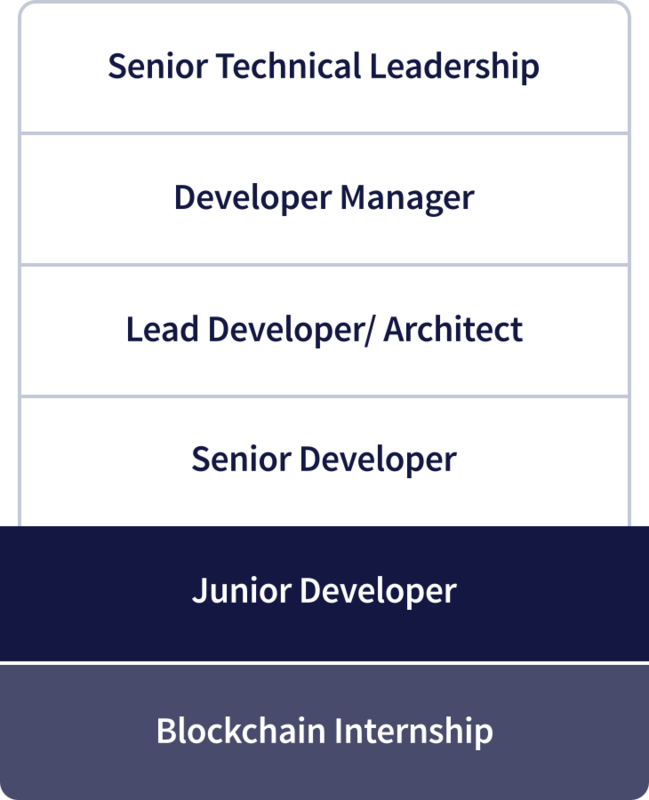 Exceptional students will have the knowledge and skills needed for an internship related to blockchain, and some may be ready for a junior developer position. We make it easy for you to offer a thorough hands-on curriculum in a space that is evolving rapidly. Our expert instructors and content creators keep our curriculum up to date and relevant.